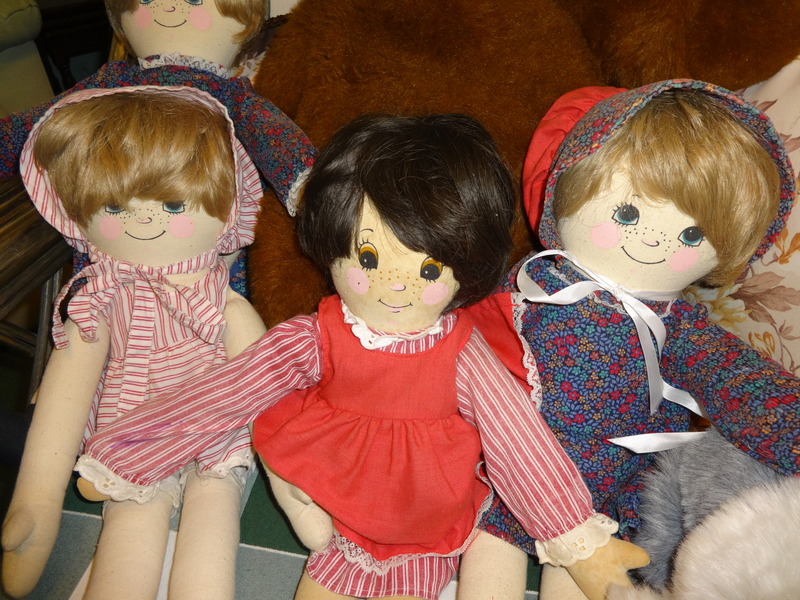 Alresford Crafts: Dolls and soft toys for Collectors and Children. For around 25 years Alresford Crafts was a major business venture in the town, making dolls and soft toys. Perhaps more than any other, this business promoted the name of Alresford to consumers across the world, until 1992! John and Margaret Jones started trading from the two lower floors of the Town Mill, a building at the bottom of Mill Hill, Alresford, which dates from 1189. Water flowing out of the pond, and under the bridge at the lower end of Broad Street, used to fall down a vertical shaft inside the mill building and there rotate a turbine, which could drive the hoist and other machinery: then the water flowed under the mill floor and downstream. Following an accident with a tree-trunk ramming down this shaft and smashing the turbine housing, causing a flood in the basement, the mill was modernized in 1972, when the stepped waterfalls were introduced, keeping the river outside the building: the basement became more habitable! When John and Margaret moved into the mill, in 1964, their first business was that of a mail order gifts company, mainly involved in Christmas gifts. In order to expand they began co-operating with a lady from Salisbury, who used a network of home workers around there: eventually they took the business over from this lady, in about 1972, when more home workers were recruited around Alresford. 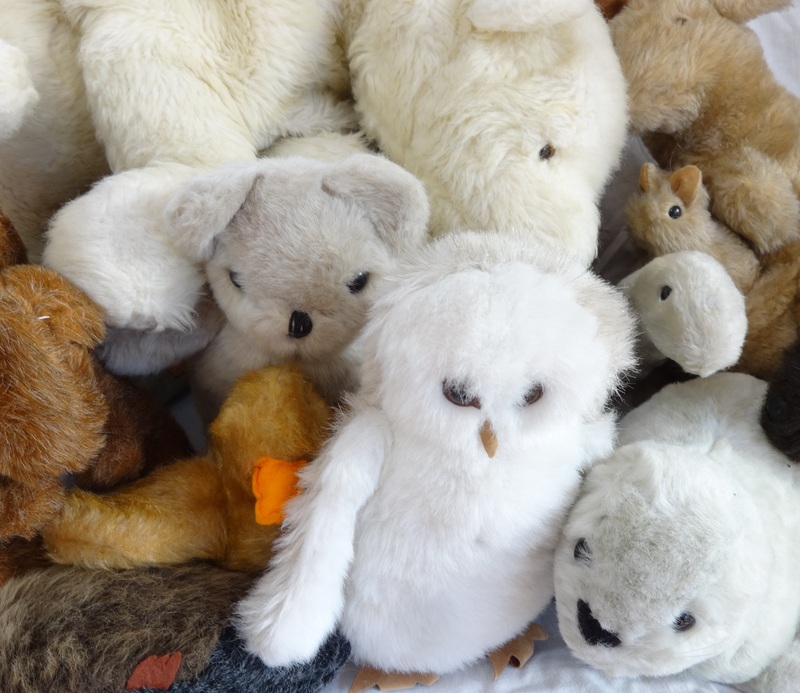 In the first five years or so, Alresford Crafts just made soft toys, designed by Margaret Jones, and the business grew and became known for quality hand-made toys: the work was brought in-house as a method of ensuring this quality. Mrs Jones says the Brighton Toy Fair made an enormous difference, with lots of orders, but it alerted a lot of the competition, like Steiff (teddy bears), to their new materials. Verena Harper worked there during 1976, as a checker and finisher, and particularly remembers the machinist girls making the toy otters had problems, because their tails seemed to twist round. Verena will be pleased to see the otters in the Alresford Museum collection seem OK. However, Mrs Jones was also interested in making dolls, and was convinced that a quality manufacturer in England could produce porcelain dolls for collectors worldwide. 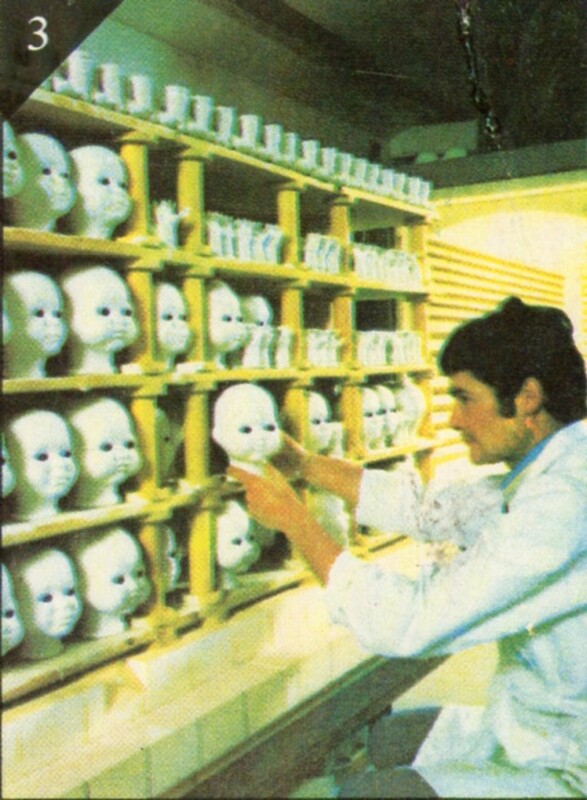 So in 1977 Alresford Crafts started planning a workshop where doll’s heads, hands and feet could be produced. Initially these were made of bone china, but then production switched to using porcelain. They were proud of producing their dolls wholly in England, and did not call their dolls ‘China dolls’. 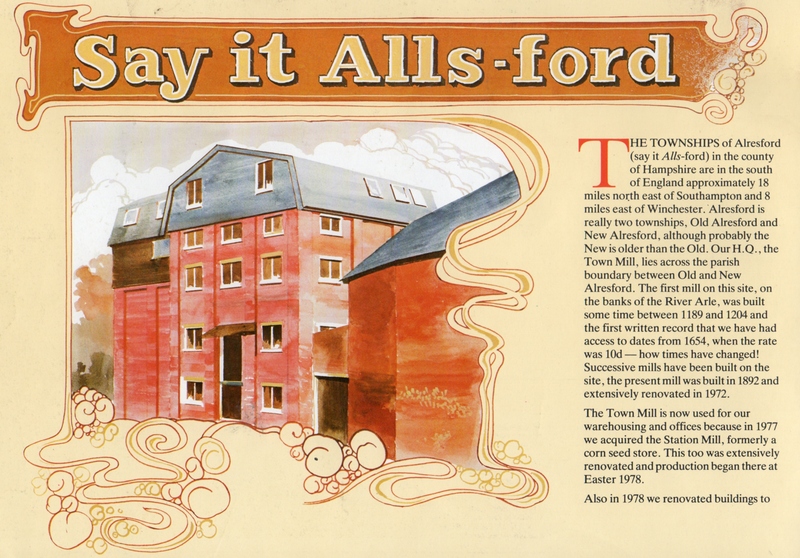 In fact the company adopted a logo that just used the word ‘Alresford’ – and so had to add a subheading of “…say it Alls-ford” to help with the problem of pronunciation, maybe particularly for the Chinese and Japanese people, when trying to order the dolls! The staff who made the soft toys found the transition to doll making, with their soft bodies, and the doll’s clothes, fairly easy. 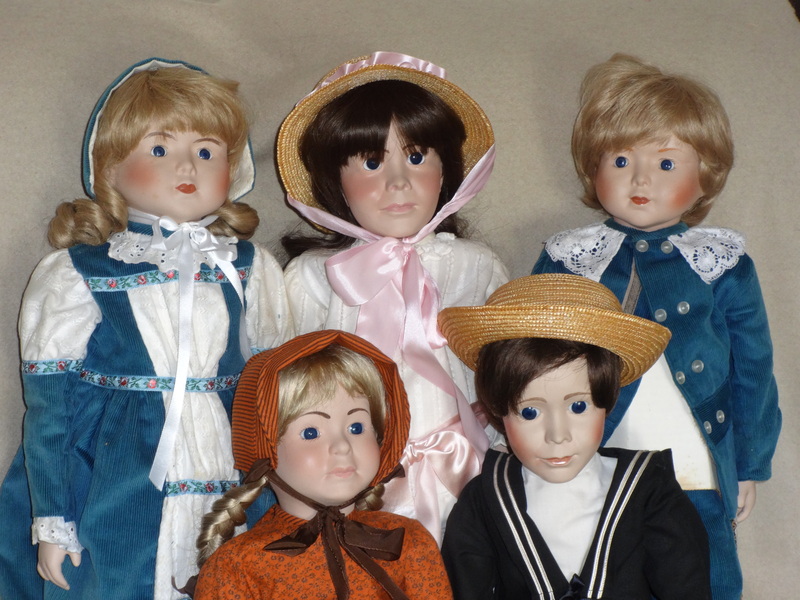 The first baby dolls were produced in 1978, and in 1979 boy and girl dolls were added, with 11 different styles. Each year saw fresh designs of doll, and soon the business moved to larger premises in another mill, a corn storage mill in the Railway Station Yard in Alresford, known as Station Mill. Next to the old Police Station, this is likely to be converted into retirement flats shortly! The Station Mill is a four storey building, and was used for producing both the stuffed toys and the dolls. On the ground floor a carding machine combed and straightened the fibres of non-inflammable synthetic material used for stuffing the toys, and the bodies for these animals were cut out in fabric by machine. On the second floor the bodies were sewn together on machines. On the top floor under the rafters the bodies were stuffed and the remaining seams sewn by hand. The toys then descended via a long chute to the ground floor, and were taken to the Town Mill for inspection, packing and despatch – going to children and collectors all over the world. Even by 1980 Alresford Crafts quoted official Distributors in Australia, Japan, France, Germany, The Netherlands and the USA. The company won design awards for their products in the USA and Japan: at one stage they even had their own warehouse in the USA, with their own sales staff. The first floor was devoted to making and dressing the dolls. Normally Margaret Jones designed the dresses and cut the material out. On one side of the workroom the “Dress-makers” made the under-garments, dresses and bonnets: in addition home-based workers were again recruited, this time to sew the doll’s clothes. Before working full time at the Town Mill from 1986, Jenny Lawes was one of these home workers, and remembers being paid five pence each for sewing a pair of doll’s pants! Production and painting of the porcelain heads, lower arms and legs was transferred in 1982 from near the Town Mill to a new Ceramics Department, located in the single storey building next to the Station Mill, which was run by Colin Larkin. Eventually the whole business employed around 35 people, including the home-workers. Most of the dolls were fairly large, typically 60cms, or two feet, tall. Today the Alresford Crafts soft toys and dolls are well known, and often sold on internet auction sites, as collector’s items. The Alresford Museum has acquired a collection of these soft toys, including the hedgehog, kangaroo (with a baby), Teddy bear, Polar bear, dinosaur and squirrel. One of the Alresford Crafts Teddy bears, known as a Honey Bear, was said to be unique in that it was designed to have a flat bottom, which made it easy to bend its legs and make it sit down properly, without having to lean against anything. 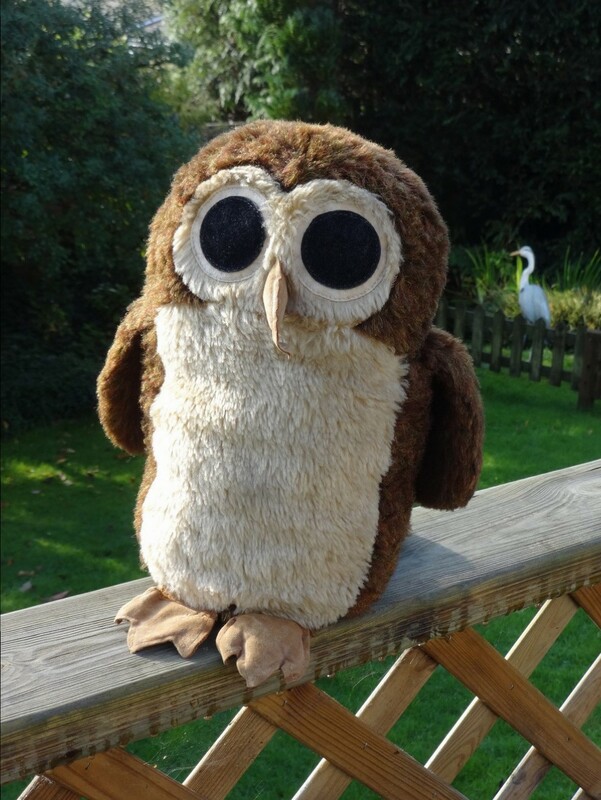 Another famous Alresford Crafts stuffed toy was the owl, which was produced in various styles and colour combinations. 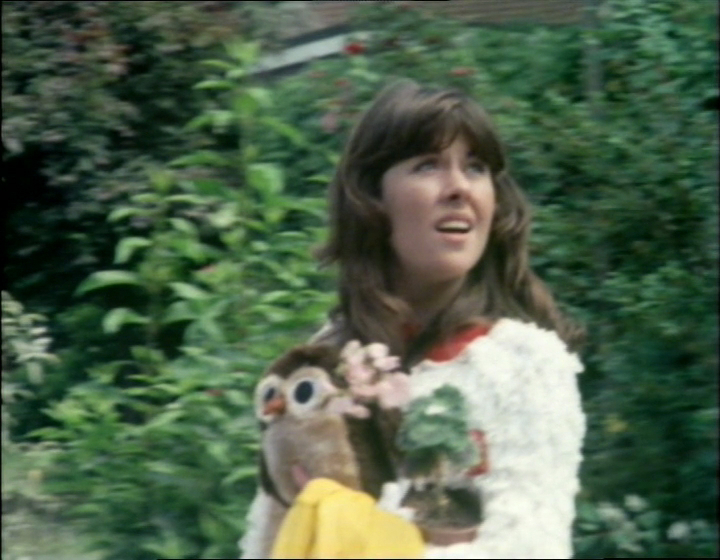 One of these, Oliver, the dark brown owl with large eyes, made a guest appearance on the BBC’s “Dr Who” programme, in Episode four of ‘The Hand of Fear’ as Sarah-Jane’s owl, when she leaves the Tardis: as yet we have not managed to find this particular version for our collection, but if you see one, let us know! 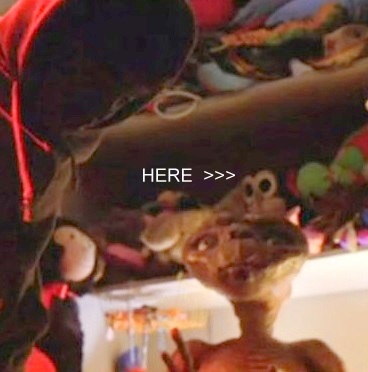 The same owl appeared in the film ‘ET’, amongst the cuddly toys in Elliot’s wardrobe, which is where ET hides. Many thousands of this style of owl were produced. Jenny Lawes also remembers Alresford Crafts producing the first versions of Pudsey, the BBC’s “Children-in-Need” bear, with the eye patch: these Alresford prototypes, built to a BBC design, had the bandage over the other eye (his left eye!). There was other work for the BBC, one presenter on children’s TV had a lamb puppet from Alresford Crafts, and the company was featured in a “Made in Britain” film, and in a Pebble Mill report. The mill also hosted visits from Angela Rippon, and even Kate Adie, but not when the latter was a war correspondent! Maybe not so well known, except to doll collectors, are the Alresford Crafts dolls, and the first example found by the Museum was a clown, produced in 1981. Notable dolls made by Alresford Crafts included the Royal Baby dolls, celebrating the births of Prince William and Prince Henry. Such was the success of the first (the Prince William doll, a limited edition of 2500 in 1982) that the Prince Henry doll was also created to commemorate the birth of HRH Prince Henry of Wales (Harry). 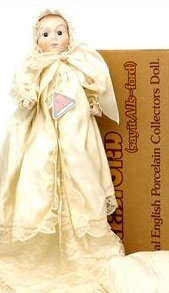 Cast in fine porcelain, and impressed on the neck ‘1984 Royal Baby RB2 Alresford’, (RB2 was a code for Royal Baby 2) the doll had blue glass eyes, painted features and a cloth body, and was dressed in a long cream satin robe with an overlay of lace, a matching bonnet and a pillow. Not quite what he looks like today, and there is not much evidence of red hair, in this model. Each doll was issued with a limited edition certificate, two catalogues and a swing tag. This baby doll measured 40.5cm (16″), and the robe was 71cm (28″) long. The Alresford Museum has recently been lucky enough to obtain 25 Alresford Crafts dolls, collected over the period 1980-1983 by Mrs J.K.Gloyn of Taunton, and still in perfect condition in the original packaging. Included in these are the Prince William doll, and several other baby dolls, plus two boy dolls, called Patrick and Benjamin! The girl dolls are too numerous to mention, but all bear the initials of the people working there, who signed the back of the labels to show who made the clothes. The ceramic heads were marked and stamped with the initials of the workers who moulded, painted and completed the ceramics. The production staff were also involved in designing the outfits, and naming the dolls! In 1982, in response to collectors’ requests for a fully pose-able jointed doll, Alresford Crafts introduced Mellissa (CD74) with a ball and socket jointed body made from a composite material – the head was still porcelain. Most of the other full sized dolls had a stuffed cloth body, upper arm and thigh: the exceptions were some of the baby dolls, particularly CD1/CD2 from 1979/80. The new style Mellissa doll was announced, at a price of £70, 40% higher than the average full sized doll, but were either never sold or quickly withdrawn, as Alresford Crafts were not happy with the quality/reliability. Later in the 1980s, a range of hand puppets and rag dolls were added to the Alresford Crafts doll collection, ie fully dressed dolls with soft bodies, heads and hands/feet. Apparently there was also some production of the black rag dolls previously described as ‘Gollywogs’, which was criticised from some quarters: the major market for these dolls was apparently to be found in export, to Nigeria. 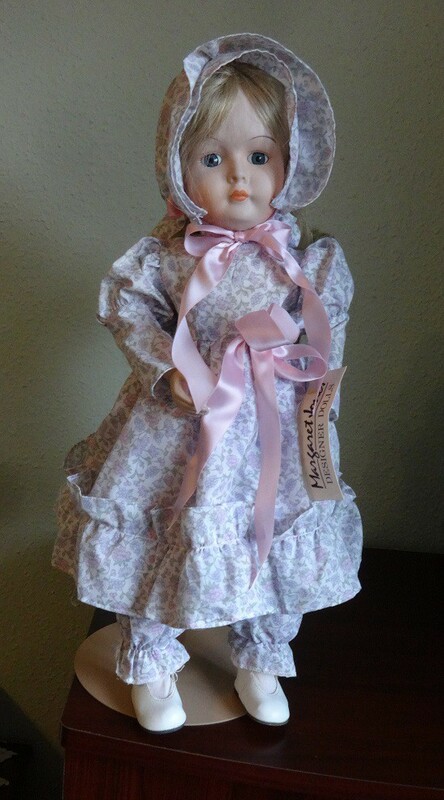 Plus the factory produced other dolls under the trade name of ‘Margaret Jones Designer Dolls’: one of these was Fiona, a favourite of Jenny Lawes, who helped design and produce her outfit. The recession of the 1980s, and the rapid growth of lower cost Chinese competition, made the volume of business turn down. The lead they had achieved with the softer filling in their soft toys was eroded by copycat products. The Alresford Crafts business closed in 1992, with a major sale of the remaining stock, attended by most of the ladies of Alresford. Verena Harper remembers that much of the left-over stock of stuffed toys, mainly rats, guinea pigs and small owls, were given to the Alresford Christmas Tree Committee, to be used as presents for the children attending the Carol singing and Father Christmas evening on Broad Street that year. A specimen of Ollie the owl, just over a foot high, has returned to Alresford from his temporary home up North – in Winsford, Cheshire. Ollie will be making a guest appearance in the Alresford Library display cabinet between now and Christmas, with lots more of the Alresford Crafts soft toys and dolls from our growing collection. So don’t forget to say hello as you collect your library books – unless of course he goes off with Dr Who and Sarah-Jane for another adventure in the meantime. News as at January 2016: The Alresford Museum has received another collection of over 100 original stuffed toys and glove puppets made by Alresford Crafts: look out for the story and photos soon!